When viewing things through a screen, can you distinguish what’s “real” from what isn’t? How much of the background in the last blockbuster movie you saw was footage of real buildings, a set put together by scenic carpenters, a scale model, or computer generated imagery? In the last fantasy film you saw, were the mythical creatures puppets, “pure animations”, or animations based on human performance capture? Are the adverts that you see in televised sporting events really displayed on the pitch or hoardings? And are the dashboard instruments in you car display “real” or “virtual”? At the time it was released in 1997, Jamiroquai’s Virtual Insanity video raised the sort of confusion that one might have imagined Victorian audiences seeing Pepper’s ghost – an illusion we will return to – for the first time. Watching the video today, you might imagine it was created using digital trickery, but in fact the illusion created was purely a physical one. There is little, if anything, in this form of production that would have prevented a similar sequence being filmed over a hundred years ago, well before the advent of digital technologies. If you’ve ever seen a floating “holographic head” as part of a Ghost Train or Haunted House fairground ride, you’ve most likely been presented with a version of Pepper’s Ghost. Taken into the theatre by popular scientist John Henry Pepper, building on a technique developed a few years by Henry Dircks, an engineer, inventor, and debunker of Victorian spiritualists and pseudo-scientists, Pepper’s ghost appeared to place a ghostly apparition alongside a “real” actor on stage. The effect is an optical and relies on placing a piece of glass at an angle and through which the audience sees the “real” on stage characters. The glass reflects an otherwise hidden area and “projects” it’s ghostly image onto the stage. 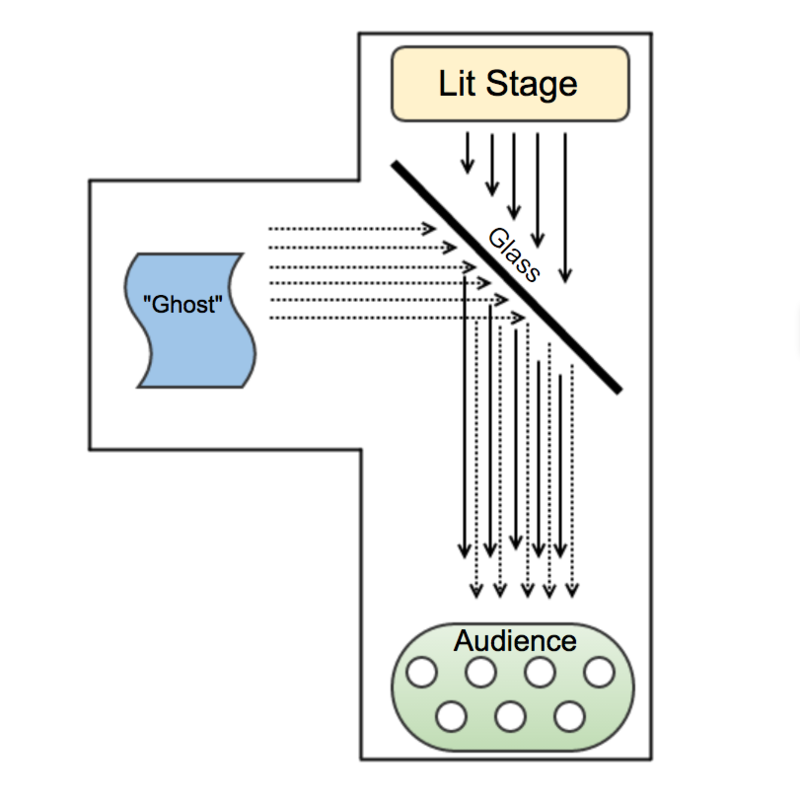 What that audience sees is the reflection of the ghost in the glass, and the main stage actors through the glass. As well as theatrical use, the effect can be used on a large scale in amusement park rides. If you are happy with an illuminated scene, the effect can be used to float static objects, and even actors, within the visual field of view of the audience. However, the same technique can be employed to use a projector to cast an image onto the glass plate; which means you can also use a digital projector. This has the advantage that you can now float (animated) digital creations, as well as filmed ones, onto the stage. If you’ve ever seen pop statistician Hans Rosling’s OU co-produced BBC Two statistics lectures, you’ll have seen this effect being used to cast huge “holographic” data visualisations onto the stage via the Musion 3D projection system. The 3D effect is created by having four separate points of view, each with its own animation, one projected onto each face of the four sided pyramid. A wide range of “how to” videos showing how to make these viewers are available online. You can also can find a range of “4 sided” pre-made videos to use with them by searching social video websites for: pyramid hologram screen up. The Pepper’s Ghost illusion provides one way of casting the digital into the physical world. Heads-up displays (HUDs) provide another opportunity for overlaying projected digital imagery onto our view of the world. Head-up displays represent a simple form of augmented reality in which the “real” visual scene is overlaid, or augmented, with additional visual information. Head-up displays have been a feature of military aircraft for many years, more recently appearing in civilian aircraft. Head-up displays use a transparent screen mounted inside the cockpit and in the field of view of the pilot onto which aircraft related information is projected. Head-up displays are now also starting to appear in top-end production cars, with the display projected onto the windscreen, HUD style attachments are also starting to appear as freestanding peripherals either using a built in “screen”, or, as in the case of the Garmin Head-Up Display, by projecting the display onto a transparent film attached to the windscreen. .
SAQ: The HUDWAY Glass demo shows vehicle lanes projected onto the display. How do you think those lanes are generated? Answer: As the device appears to be free standing, and is not apparently attached to a camera, I suspect that the lanes are generated using GPS and map data. The fact that the lane appears to predict, rather than track, the actual view of the road would appear to confirm this. These helmet displays project the display onto a transparent screen within the field of view of one of the wearer’s eyes. This approach is rather more elegant than other “in-sight” displays such as the original version of Google glass or the Garmin Varia Vision cycling glasses. Indeed, we would probably not class these as true head up displays because the intention is not to overlay a transparent display layers onto the visual scene. Instead, a small screen is inserted into the field of view and occludes the scene over the visual angle it intrudes into. Given the requirement for a physical layer onto which the head up display layer or layers can be projected, more “natural” forms of eyewear in the form of glasses present may be required for mass adoption of everyday head up displays or augmented reality wear. However, as with the bulky and not particularly becoming 3D glasses for watching 3D cinema films, frames such as Sony’s SmartEyeglass look as if they still have some way to do in the fashion design stakes, and minituarisation of the projection technology seems to be issues for other display innovators such as Magic Leap. In the workplace, however, where protective equipment may be the norm, there may be more freedom to develop augmented reality displays mounted within protective headware. Once again, smart helmets may provide the answer, such as the DAQRI Smart Helmet. SAQ: How can the Pepper’s Ghost illusion be used to render augmented reality layers in the field of view of a viewer? SAQ: what practical problems does the use of Pepper’s Ghost style projection introduce into the design of a head-up augmented reality display? SAQ: what other uses can you think of – or discover – for head-up displays? Extension SAQ: what other ways might them be of projecting visual imagery into a physical space?